Weddings are a joyous occasion but they can run pretty expensive too. There’s the catering, rental location, invitations, wardrobe and let’s not forget the flowers that can set couples and family members back a pretty penny if you’re not careful. Since most newlyweds don’t have a special savings account devoted to paying for an extravagant soiree, it’s a good idea to watch the budget closely and find ways where you might be able to cut costs by applying a little of your own creativity. I realize, this isn’t a new concept. Brides have been attempting to do as much as they can on their own for centuries like arranging simple garden bloom arrangements, using tea lights in place of more elaborate décor and learning calligraphy to design bridal stationery. These are all great ideas when they work out the way you want them to but as you may already know, there’s always a possibility for error if you’re not gifted in the art department. Don’t fret if you find yourself fitting inside this category because you still have a shot at saving a buck by taking on particular wedding projects that have a lesser chance of ending up catastrophic if you don’t possess an “artsy” eye. One area that I recently witnessed a fantastic example was a party favor gifted after a barnyard wedding ceremony. The setting was rustic, rural and gorgeous, surrounded by farm animals, wispy hay stalks and divine rolling country that went on for miles and miles. The family cleverly used the location as a basis for the theme and incorporated as much natural beauty as they possible could take from the landscape. 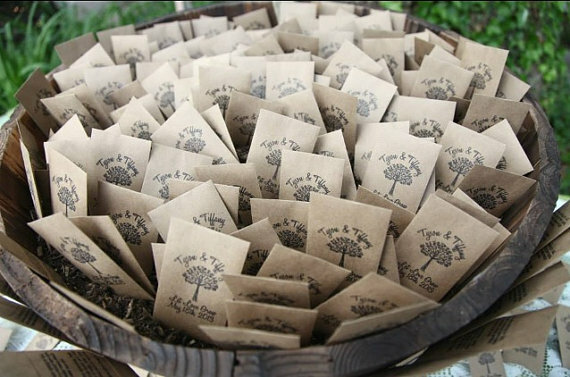 The floral bouquet, cuisine and decorations all mirrored the stunning ambiance, especially the seed packages they gave to guests. Believe it or not, you can easily make these at home by purchasing brown envelopes and filling them with whatever types of seeds you prefer (although wild flowers would appropriately match the scene). Personal touches can be added by buying monogrammed stamps and ink where you can leave the couple’s initials and date of marriage as a keepsake. Let your friends and family take home these sweet little packages and allow them to grow from your love when the warmer gardening months roll around.